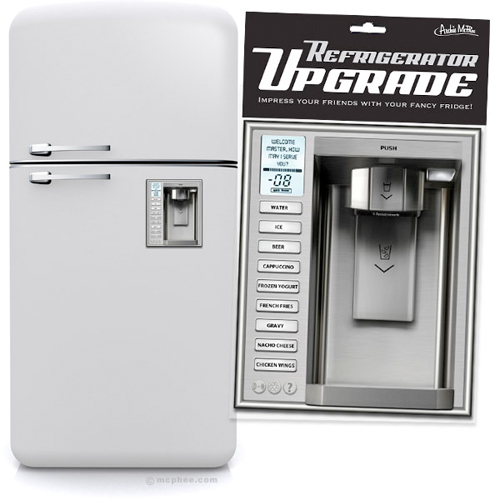 Sometime next year (and hopefully not on April 1st), we will see a true revolution in refrigerator technology. Water and ice dispensers are one thing, but one that pours forth nacho cheese? Instant winner for Best Technology Of The Year. The roots will be traced back and it will be realized that all credit for the idea belongs to Archie McPhee for their representation of a quality refrigerator door with this Refrigerator Upgrade Magnet. Of course, sooner or later some other company will improve upon the model and add chicken wings and frozen yogurt just like on the magnet. Of course regardless of the source of inspiration, a trick like getting your fridge to dispense french fries and chicken wings deserves all the accolades it gets.